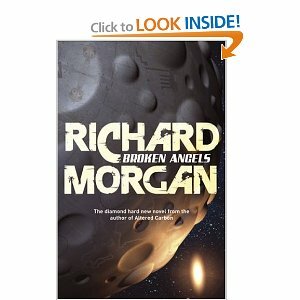 I just finished reading Broken Angels by Richard Morgan, the follow up to Altered Carbon which I previously read and enjoyed. Altered Carbon had a really cool sci-fi noir feel to it. Does Broken Angels continue this theme? No. Instead of a detective novel on Earth the anti-hero Takeshi Kovacs is soldier of fortune in a civil war on another planet. There is no overlap with the previous novel, only a few oblique references which makes this an episode in the adventures of Takeshi Kovacs and not a continuation of a saga. The only carry over is being set in the same universe with the same technology (digitized consciousness retrievable after death, FTL communication and some other goodies). There is no detective aspect to this novel, it is just war that you don’t really care about and neither does Kovacs. The only upshot is that the long lost Martian civilization which serve as mysterious benefactors of the technology is expanded on. Morgan describes an interesting universe whose history and pieces fit together well. The many down shots are the plot twists that were so clever in the first novel end up being not necessary in this novel and cheaply contrived – ohh this booby trap was set up by mysterious unnamed enemies that aren’t even important – that sort of thing. Even after the revelatory and wrap-it-up passages towards the end I lost count of the double crosses and not sure if Kovacs had done the right thing or not. I know he’s an anti-hero and all, but he wasn’t hero or anti-hero, just a guy and that’s kind of boring. Also Morgan goes out of his way to avoid using the plot device – retrievable consciousness – that he used to good effect in Altered Carbon. If the “stack” that holds everyone’s digitized personality is always lost them I’m left asking “what’s the point?” which I found happening frequently as I read this book. You want to find out more about the universe that Altered Carbon was set in. You want another sci-fi noir detective novel like Altered Carbon. This book can stand alone without having to read Altered Carbon first and there is very little to be gained by reading Broken Angels just because you liked AC. I’m usually a sucker for a trilogy and ordinarily would read the next in the series, Woken Furies, but after my experience with Spin Drift I’m going to go with my gut instinct and save my time and my book-money for something else.